Before you commit to buying big with Bruders 1:16th toys, we have compiled a list of theIr top attributes that make them one of the best toy makers in the world. A glance at a Bruder tractors or vehicles may tell you everything you need to know before buying. But if you dig deeper you can find out some interesting facts, whether its positive or a negative. 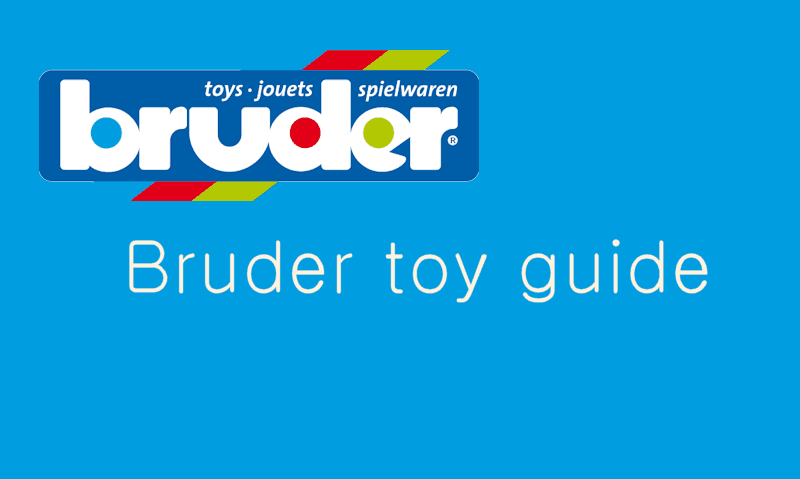 You'll be glad to know Bruder make all their toys in their country of origin, Germany. And have not taken the same route rival producers take - made in China or countries commonly used in cheap labour. The benefit of the ‘made in Germany' label is a product made in the EU with tough employee standards, and of course a superior product using quality raw materials. On the down side, because of higher labour costs, Bruder do have to make a sacrifice themselves, and this is the way their toys are made. This comes in lack of effort in assembling their toys and rely on the original mould to replicate detail in the parts. So instead, a quick and easy ‘clip-together' method in the manufacturing process is used to assemble the model in a matter of minutes. When you buy any toy from the huge Bruder range, every single item comes in 1:16 scale. With all toys made in this size, no mistakes are made when it comes to the customers buying options. Common mistakes for the customer includes a product range with multiple scale choices like 1:32 and 1:87. So with those with little knowledge of scale or this sizing method, you could be left with a toy tractor not suitable with the corresponding trailer or implement. Bruder vehicles are not made with electrical components one single bit, so no batteries required. This is especially important because Bruder prides itself on their "for use indoors and outdoors" strap line and getting the vehicles wet would pose a problem to the circuitry. However you can transform a number of Ruder vehicles with lights and sounds, using the Bruder (02801) Lights and Sounds Module with batteries included. What Bruder do best is the ability to steer the wheels of the vehicles with help from a steering rod. This rod is stored - usually behind the vehicle - somewhere by the hitch. But it may also be tucked away under the vehicle for when you need it. Simply take the rod and thread it through the opening panel on the cabin roof, and slot it into the steering wheel to control the wheels. Well it's worth considering large tractors and vehicles would be more suitable for matching larger trailers, all vehicles have a rear hitch to hook up a corresponding Bruder trailer towed behind. Not all vehicles have a hitch nor do trailers suite all vehicles in the range, but as a rule of thumb, Bruder tractors all have hitches for towing farm implements and trailers. Bruder have teamed up with a number of manufacturers to produce officially licensed vehicles baring the logo and branding. You can expect to find a toy tractor or agriculture vehicle from all these machinery manufacturers listed above. Yes that's right, although Bruder vehicles are made for play outside on the patio or on the mud or grass, the build up of goop will result in corrosion of the metal parts, with muck clogging up the free rolling wheels. To overcome this, dry days where the ground is bone dry is good practice. If playing out in the wet is a must, be sure to regularly maintain the Bruder vehicle by washing it with warm soapy water - or using a hose works best. When investing in Bruder's massive 1:16 scale toys, bare in mind Bruder farm toys size restriction applies, due to the area required to manoeuvre the vehicle with the steering rod. Sure, a little space in the dining room or living room will be suitable for smaller models, but expanding the child's collection will take up a lot of space. Whatever Bruder model you choose from, rest assured all Bruder toys are for children 3 years and up. However the Bruder Roadmax is targeted for toddlers from 2 years and up. Be sure to check the manufacturers recommended age before purchasing. Whether you choose from Bruder's agriculture, construction, emergency or commercial range, all tractors, trucks, lorries and vans have free rolling wheels with most a rear hitch. But you can also expect opening bonnet, opening doors, and access inside the driver's cab one way or another - with additional accessories included.